These photos were taken on Wednesday, November 15, 2017 at 8:15 AM. The location was in the side yard of my home in Bethesda, MD. The "Take It!" came from my recently opening the lid on the trash can in which I store bottles which I retrieve from my neighbor's recycling bins on Thursday mornings. For some unknown reason the empty bottles were positioned in such a way that they almost had the look of being freshly caught fish that had somehow been partially trimmed and were still wet. 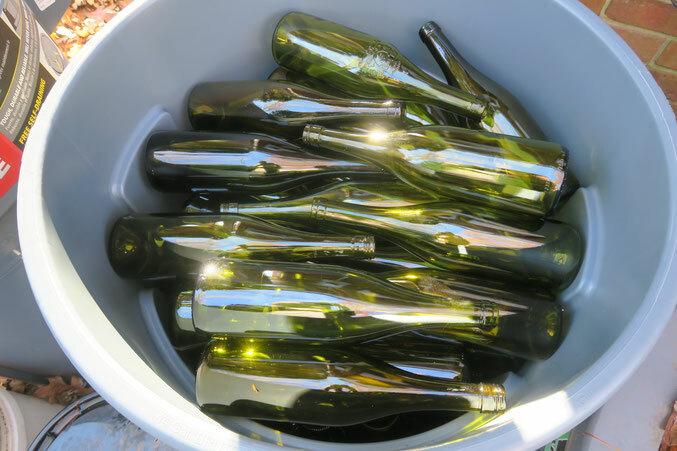 I included some photos taken of several of the assorted bottles collected. The reason for my collecting them is to use them for the basis of some products I have in mind and am presently slowly developing to bring to market. I must complement my neighbors on their very good taste in wine selection. The yield is usually about 28 bottles per week on the one morning of gathering. I then bring them home and remove the labels. The variety of quality of the glue used is quite another story, even the most stubborn fall when I use a razor. 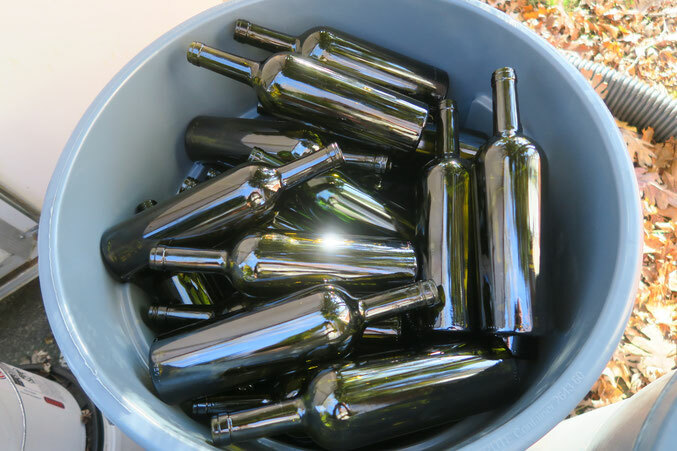 After the glue residual is removed - I then put the bottles through my dishwasher before placing them in the "fish barrels in the side yard." I can hardly wait to get full use out of my right arm so that I can proceed with a faster pace in the experimenting being done before deciding on final products. Heh, bottle fishing... I like the title, seems very fitting. I'm interested in hearing about what you do with these bottles. We usually have an empty bottle of wine every couple weeks and just recycle them. Is it something I could turn into a fun summer time project for the kids? I'm always on the lookout to find activities for them because I cannot stand hearing them say "I'm bored!" Wow 28 bottles each time is quite the collection. How long ya been doing it? You must have hundreds. Jeez that is a lot of bottles, those are big trashcans and they're all full. Hello to all. Thank you for your comments and questions. I am regaining strength in my right arm and hand, but not enough yet to be given permission to do the push pull stuff which is needed to make the products I have in mind using the bottles. 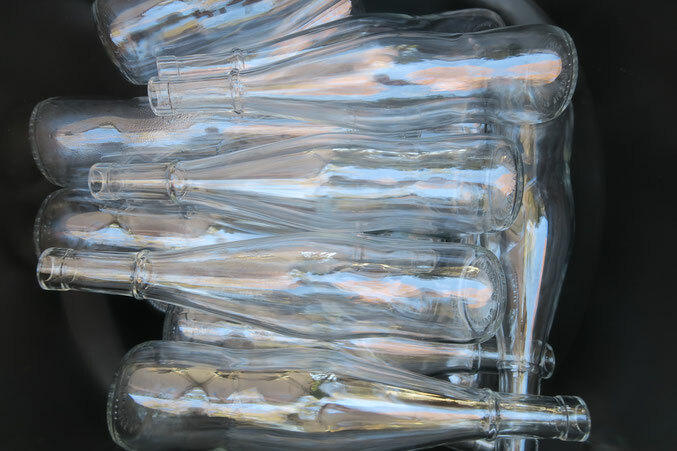 I am having some of the bottles fired in a kiln to reshape them and just bought a buffer to bring the sparkle back to the glass that was lost in this process. The product will soon be shown on the site and be available for purchase. This has been several years in the making, but fun in the doing. Jim: Thanks for the complement on the title - it took a long time for it to come to me - and one day - pop ! and it was there. 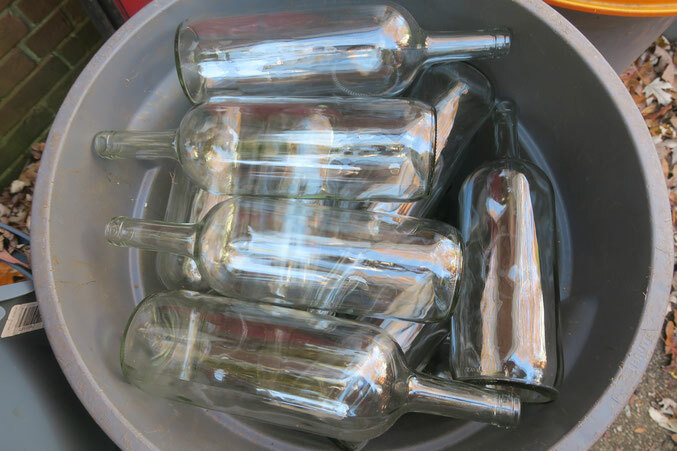 Sally: Sorry I cannot pass along a use for your bottles at home as what I am doing with them is fairly complicated. Perhaps the children could collect and crush aluminum cans as there are still some places that will buy them as scrap. SF1967: I have been collecting bottles for almost two years. I have gotten the label removal to be an easier task through experimentation. I have also gotten more selective in what it is that I collect. I have returned to the recycling stream some bottles that do not fit the use I now have in mind for them. Gabe: Yes, I now have aprox 300 bottles. I am glad to be getting close to a finished product which I can put into the market place. Yuppie7: There are not any Frat houses in the area, but there is one house in the neighborhood that is shared by a bunch of young guys that hammer down a lot of beer. There have been times when I have been tempted to pick up the cans and take them for $ - but I really am too busy to go through the steps to do that. 300!?!? Wow! Well at least you won't have any problems maintaining stock. Ha ha! Good to hear from you. I wish I could get them collecting cans and bottles for recycling. It'd be nice to teach them the value of labor outside of their allowance, but we haven't had one of those recycle trade in places for years.